Two recent TV references books are worth your consideration this holiday season. 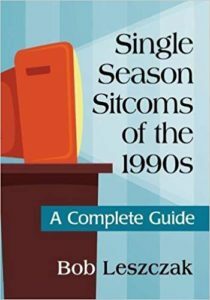 SINGLE SEASON SITCOMS OF THE 1990s: A Complete Guide by Bob Leszczak This is a great book — and more than another “just the facts ma’am” reference book — — but the title isn’t entirely accurate. The author takes an extremely broad view of what consitutes a sitcom. He includes some single-season, hour long shows like AGAINST THE LAW, ADVENTURES OF BRISCO COUNTY, CUPID, FREAKS AND GEEKS, GOING TO EXTREMES, HARTS OF THE WEST, SPY GAME and TEQUILA AND BONETTI that most people would never consider situation comedies. And, in a book on Single Season sitcoms, he has a large section on shows that came back for an abbreviated, and/or very different second season like ALMOST PERFECT, BOB, and THE JEFF FOXWORTHY SHOW (this section is fascinating, because he explores the reasoning behind the often radical format changes that granted some of these doomed shows a second year of life). But do I care about those strange anomalies in a book about Single Season Sitcoms? No, I don’t, because this book is pure gold for a guy like me. He could have included a section on two season shows with female leads, a section on American shows featuring British actors, or a section just on TV private eyes, and I would have simply said — MORE! MORE! The book is jam-packed with tons of useful information. Each listing not only describes the premise of each show in detail, but often includes interviews with key production staff, like the producers, directors, writers and cast members (though sometimes the quotes from them are formatted with special indentation, and other times not, which doesn’t make a lot of sense). The majority of listiings mention the names of the showrunners or creators, but I wish every single listing did. One of my favorite listings tells the story behind the trainwreck IT HAD TO BE YOU, the ill-fated 1993 sitcom starring Faye Dunaway and Robert Urich…that initially starred Twiggy and another actor…and by the time it was over, four weeks later, only starred Urich. Another memorable listing tells the complicated history of 1995 sitcom MINOR ADJUSTMENTS, which went through many major adjustments over its short life, which spanned 20 episodes and two networks. I loved this book. No TV reference library is complete without it and the previous two volumes, SINGLE SEASON SITCOMS OF THE 1980s and SINGLE SEASON SITCOMS 1948-1979 (both of which I reviewed here). I can’t wait for the next edition! 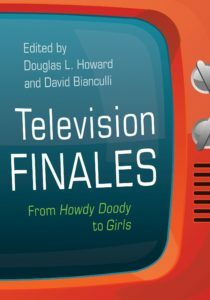 TELEVISION FINALES: From Howdy Doody to Girls, Edited by Douglas L. Howard and David Bianculli. A book about televsion finales is long-overdue and I was eager to read this one. This 500-page opus is more of a series of critical analyses than a reference work, with experts like TV critic David Bianculli, TV reference book author Douglas Snauffer, and TV historian Robert J. Thompson offering their insights in essays that cover 71 finales, including such classic and controversial endings as Newhart, Seinfeld, Lost, The Sopranos, St. Elsewhere, M*A*S*H and Nichols. They also cover obscure, short-lived shows like Jericho and British series like Life on Mars and Spaced. The reasoning behind which finales were chosen to include in the book isn’t clear, so we don’t know why the enders for shows like Magnum PI, Jag, Miami Vice, The Paper Chase, CSI, Who’s the Boss and The Odd Couple were overlooked, while space was given to lesser-known series like Rectify and Carnivale. The essays are interesting and, in most cases, thoughtful and well-considered, with the finales put into both historical/cultural context as well as within the context of the narrative of the often long-running shows themselves. But basically most of the entries are scholarly opinion pieces, the authors explaining why they think a particular finale was memorable or forgettable, good or bad (for example, Martha P. Nochimson hated the finale of Battlestar Galactica, faulting series creator/writer Ronald Moore for driving “the show where it could not and should not go” and frakking-up the finale) I didn’t always agree with the authors’ conclusions (personally, I thought the Galactica finale was great and emotionally satisfying), but that didn’t lessen my enjoyment of the book. I wish, though, that the book focused far less on the opinions and analyses of the authors and more on the actual development and production of the finales, with interviews with the writers, directors, and cast members.